After you’re hurt on the job, your employer might be skeptical about the injuries you claim to have received at work, or the extent of harm they caused. By ordering an independent medical examination, the employer, insurer, or even the Ohio state Board of Workers’ Compensation can obtain what should be an objective assessment of a worker’s injuries, their likely origins, and how long they will take to heal. Read on to learn about what to expect at an independent medical examination. 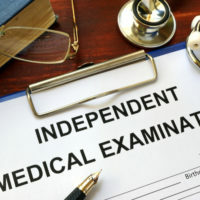 Why would an independent medical examination be requested? When you attend the examination, remember that the doctor issuing the exam is not your personal doctor. In fact, part of that doctor’s job is to determine whether you have made your claims honestly and to catch any inconsistencies in your story. That doctor has received copies of all your medical records and has had a chance to review them thoroughly. They may ask you the same question multiple times to ensure that the answer remains the same as you’ve provided previously and as you provided in your original claim. The doctor will also ask questions about how the accident occurred and how your treatment has progressed. You have no right to doctor/patient confidentiality with this person. The physician will take note of how much pain you appear to be in and whether you have a limp or some other symptom of the injury you’ve claimed. The report created by the doctor during an independent medical exam can have a substantial impact on the value of your claim. In order to protect your right to compensation after an on-the-job injury, consult with a skilled workers’ compensation attorney if your employer is requesting that you submit to an independent medical examination. If you’ve been hurt on the job in Ohio, get help receiving the money you deserve for your injuries by contacting the dedicated and skilled Columbus workers’ compensation lawyers at Miller Law Practice, LLC for a consultation, at 614-591-6822.